It's easy to see why Washington baseball fans are a confused lot. Their original team, the Washington Senators, played in the National League until 1899. Then they became an American League team in 1901, called by the new ownership the Nationals so as not to have them confused with the old Senators. But fans kept calling them the Senators, while the team kept calling itself the Nationals, and everybody else nicknamed the team the "NATS," although nobody was sure whether that was short for NATionals or SeNATors. It wasn't until 50 years later the team began officially calling itself what the fans had been calling it all along. To top it off, the team moved to Minnesota in 1961 to become the Twins. But a new franchise stayed in Washington called the Senators, until that franchise moved to Texas to become the Rangers in 1972 and was replaced by another new Washington team called the Nationals, which relocated from Montreal after the 2004 season. Got all that? Here it is again, only a little slower, and with more detail. The National League operated a franchise in Washington until 1899. That team, called the Senators, folded and the new American League took Washington as an original franchise city when it began play in 1901. This team, called the Nationals, opened with a 5-1 win against Philadelphia's Athletics on April 26, 1901. In 1912-13, Johnson had perhaps the best back-to-back seasons any pitcher has ever had. so doing he single handedly pulled the Nats into the first division for the first time. 1912 he went 32-12, with a 1.39 ERA and 303 strikeouts. 1913 he was a staggering 36-7, with a 1.14 ERA and 243 strikeouts in 346 innings. In 1920, Clark Griffith bought the team, beginning a 72-year association between his family and the franchise. He enjoyed his greatest success when the team won the 1924 championship  the only World Series triumph for a Washington team. Bucky Harris played second base and managed the team, while Hall-of-Famer Goose Goslin drove in 129 runs and hit .344. Johnson did his part, turning in a stellar 23-7 season to lead the pitchers. Washington faced the New York Giants in the World Series, and it went seven games. Having already pitched two games, Johnson took the mound in relief in Game Seven with the score tied, the bases loaded and no one out. He got out of the jam and shut down the Giants until Washington plated the winning run in the 12th inning, set up by Johnson's single. Washington repeated its league triumph in 1925, but lost the Series to the Pirates  this time blowing a 3-1 lead in games. An exhausted Johnson was battered for nine runs in the decisive game. It was Johnson's last taste of postseason baseball. Johnson retired after winning 417 games, second most in history, for a team that rarely finished in the first division or with a winning record. His career ERA was 2.17. He struck out a then-record 3,508 batters in an era when few players, even sluggers, struck out frequently. His strikeout record lasted 60 years, and his total of 110 career shutouts still stands. After a string of mediocre seasons, Hall-of-Famer Joe Cronin led the Nats to the 1933 pennant as manager and shortstop. He had lots of help from Hall-of-Famer Heinie Manush (.336 with 95 RBIs). The Nats lost the Series to the Giants again  this time in five games. After 1933, the Nats went into a long decline. They were rarely in contention, leading to the birth of the mantra that "Washington was first in war, first in peace and last in the American League." In fairness to the franchise, the Nats weren't all that horrible - they finished last six times between 1934-1960. The absence of a contending team, shrinking fan support, an aging stadium and the lure of greener pastures in the upper Midwest convinced Griffith to move the franchise to Minnesota. Washington lawmakers would not let him go until the American League agreed to award one of its 1961 expansion franchises to the nation's capital. The original Nats played their last game in Washington on October 2, 1960, losing 2-1 to Baltimore. A new expansion franchise, which everyone agreed would be called the Washington Senators, began play in 1961. Meanwhile, the team now named for the twin cities of Minneapolis and St. Paul, won its first game, 6-0, at Yankee Stadium. But with slugging stars Harmon Killebrew and Bob Allison soon joined by shortstop Zoilo Versalles and outfielder Tony Oliva, the Twins became a contending franchise again. Collecting pitching talent such as Camilo Pascual, Jim Kaat, Jim Perry and Jim "Mudcat" Grant the next few years made sure they stayed that way for several years. The 1964 Twins finished fifth, but there were signs of what was to come  Killebrew clouted 49 dingers (his fourth consecutive 40-plus home run season) and rookie Oliva hit a league-leading .323. The Twins won the 1965 pennant as Oliva led the league again at .321 (the only player to win batting titles his first two seasons) and Versailles had an MVP year. Ironically, the Twins clinched the flag with a 2-1 win against the new Washington Senators. The Twins bowed to the Dodgers in a pitching-rich seven game Series. With Billy Martin at the helm, the Twins won the first American League West title in 1969 paced by Killebrews 49 home runs and 140 RBIs. However, Martin left after losing the playoff to Baltimore. Bill Rigney led the Twins to a 1970 encore but he also lost to the Orioles. The Twins lost Killebrew after 1974 and Oliva after 1976, but they still had Rod Carew, who made the American League batting crown his personal property with seven titles. His most noteworthy season was 1977, when he flirted with a .400 average before finishing at .388. The Twins left cozy Metropolitan Stadium for the Hubert Humphrey Metrodome after the 1981 season. Two years later the Griffith family ended their seven decade control of the franchise, selling to local businessman Carl Pohlad. It would take a relatively unknown manager in Tom Kelly cultivating a new generation of sluggers in homegrown Kent Hrbek (34 home runs and 90 RBIs), Kirby Puckett (.332, 28 homers and 99 RBIs) and Gary Gaetti (31 homers and 109 runs-batted-in) to bring the Twin Cities back to the World Series and a seven game triumph against the Cardinals in 1987. Four years later they repeated behind a veteran pitching staff led by Scott Erickson's 20-8 record and Jack Morris' 18 wins. Morris turned in a Series performance for the ages in Game Seven, shutting out the Braves on seven hits for 10 innings until his team scored in the bottom of the 10th for a 1-0 win. The Twins fell on hard times with eight consecutive losing seasons until 2001 when they returned to the top of their division. And in 2002 they were division champions under the steady hand of new manager Ron Gardenhire and led on the field by fearless centerfielder Torii Hunter and pitcher Johan Santana (Cy Young Award winner in 2004 and 2006). When those two left later in the decade, a new crop of players led by homegrown catcher Joe Mauer (three batting titles, 2009 MVP), first baseman Justin Morneau (MVP in 2006) and pitcher Francisco Liriano led the Twins to Central Division titles in 2009-10. The Twins also benefitted financially by moving back outside to Target Field in 2010, setting a franchise record as more than 3.2 million fans clicked through the turnstiles. On October 11, 1900, Washington D.C. was awarded a franchise in the soon to be American League. This franchise was the Washington Senators who six decades later became the modern day Minnesota Twins. 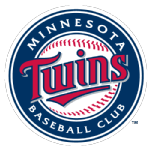 Did you know in the twelve home World Series games that the Minnesota Twins have played in, the only defeat came at the hands of Sandy Koufax ? In 1988 the Minnesota Twins became the first American League team to pass the 3,000,000 mark in attendance during a single season.